CHARLES HUDSON was born in Camberwell in 1866 and died at the age of 80. He was not only a remarkable and versatile musician but a clever mechanic in both making and repairing all kinds of musical instruments. He was the inventor of the mandolin-banjo, for which he held the rights under Patent No. 1484. The instrument was built like a miniature zither-banjo, with four double strings tuned to the notes and pitch of the mandolin. The tone was shrill because of the 5½inch vellum. The scale used was 12¾". He had a unique style of playing both banjo and mandolin and his mastery of the slur, snap, slide, vibrato, harmonics, tremolo and rasp was extraordinary. In his arrangement of the "Policeman's Holiday" he produced a clever imitation of the voice and by using his nail on the covered string actually made the sound of a policeman's whistle. He possessed a great sense of humour and delighted in giving amusing demonstrations of various players. Using tremolo with his fingernail on the banjo he would give a perfect imitation of a person playing the mandolin. 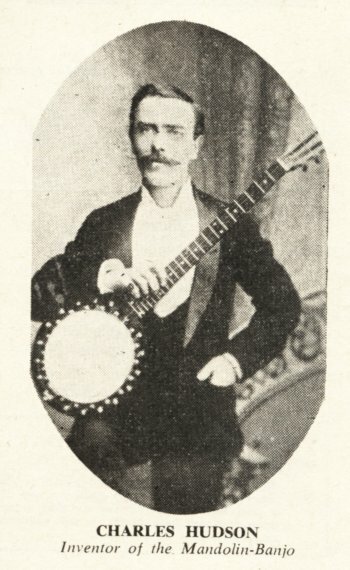 Mr. Hudson opened a music shop and started the South London Banjo Studio about the year 1888. His enthusiasm as a teacher of banjo, mandolin, guitar and violin soon carried so many recommendations that eventually he was teaching over eighty pupils a week. The result of this splendid effort is still in evidence today, as many present-day banjoists had their first spark of enthusiasm kindled either by his early lessons or when listening to his skilful playing when he went on tour on the music halls. "The Star Polka", "Lilla Barn Dance" and "March Des Petits Pierrots", but it was his "Limelight Waltz", published by Dallas, that became the hit of the day. He was one of the three Hudson brothers, all musicians and makers of instruments. The eldest brother, Harry, built an organ and presented it to the Masonic Hall, Camberwell. The youngest brother, A.J. Hudson (now 72), still has in his possession the first mandolin-banjo ever made. In some of their shows A. J. Hudson played a remarkable instrument, which consisted of a zither-banjo and a mandolin-banjo joined together. He played them both at the same time. The brothers produced the "Hudson" zither-banjo (which is shown in the accompanying photograph of Charles). It had nice rounded frets about 3/16th of an inch wide to facilitate the smooth playing of the slide or slur which he used a great deal. Many fretted instrument players in South London will remember the kind and practical advice so freely given by Charles Hudson whenever a difficult problem cropped up to do with an instrument. He was good hearted, too, and if a poor street musician called to have his instrument repaired it would be done while he waited without charge if Mr Hudson thought the man was hard up. He would even send him off with a complete set of new strings and a few words of encouragement and advice. Charles Hudson spent his entire lifetime promoting interest in banjos, mandolins and their music—he was a real pioneer enthusiast and an interesting character right to the end.